A Summer Full of Fruits, Vegetables and Fun for Seniors! 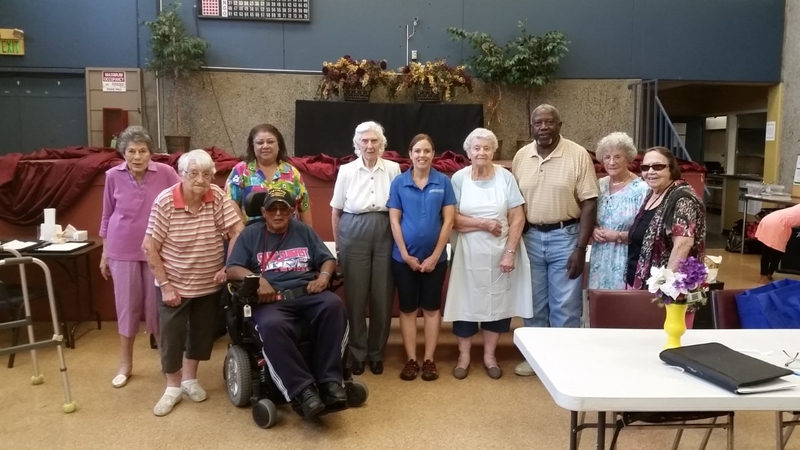 Many people view summertime as a lazy, relaxing time of year, but not the 25 senior citizens at Fresno's Lafayette Community Center and Pinedale Community Center. These seniors spent their summer learning about maintaining a healthy lifestyle by including more fruits and vegetables in their daily diet. 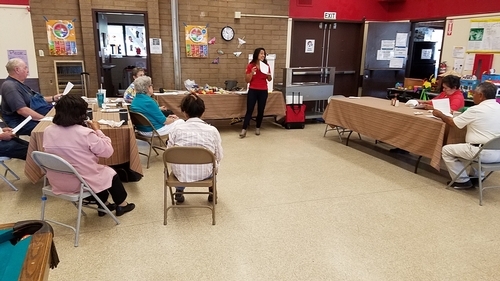 Nutrition Educator, Consuelo Cid, teaching seniors at Lafayette Community Center how fruits and vegetables contain many vitamins and minerals our bodies need daily. 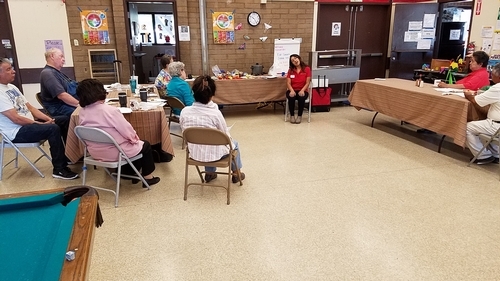 The UC CalFresh Nutrition Education program collaborated with Fresno's Parks and Recreation Department to offer senior citizens in the Fresno community no-cost, nutrition education classes over a 5-week period. The Eat Smart, Live Strong curriculum gave seniors tips on how to include more fruits and vegetables in their diet and how to save money while still eating healthy foods. Seniors were also able to taste quick, inexpensive and healthy recipes prepared by the UC CalFresh staff every week during the series. Nutrition Educator, Consuelo Cid, demonstrating how to cool down after doing any physical activity with seniors at Lafayette Community Center. The seniors at both community centers also learned about physical activity because it is an integral part of a healthy lifestyle. Everyone participated in learning four new exercises at each class session along with the proper way to warm up and cool down when exercising. Participants graduated after the 5-week session with a certificate of completion from the University of California and nutrition education reinforcement items to remind them to continue on their journey towards a healthy lifestyle. These items included reusable shopping bags, cookbooks, reusable water bottles and fruit and vegetable scrub brushes. The seniors expressed how informational and fun these classes were for them, and promised to continue eating fruits and vegetables every day and participating in at least 30 minutes of physical activity most days of the week. Nutrition Program Coordinator, Kristi Schultz-Sharp, with the Eat Smart, Live Strong graduates at Pinedale Community Center. Your post is cery nice thanks for sharing this post..